THE WAY IT WAS is the story of Stephen South, a young British racing driver in the Seventies who seemed set for the glory that ultimately fell instead to rival Nigel Mansell. Where one went on to become one of the nation’s most loved characters and the World Champion in 1992, the other’s career faded to a footnote in the cruelest circumstances. This is a multi-faceted tale of struggle, success, disappointment, controversy, the continuous battle for funding and recognition and, ultimately, heartbreak. 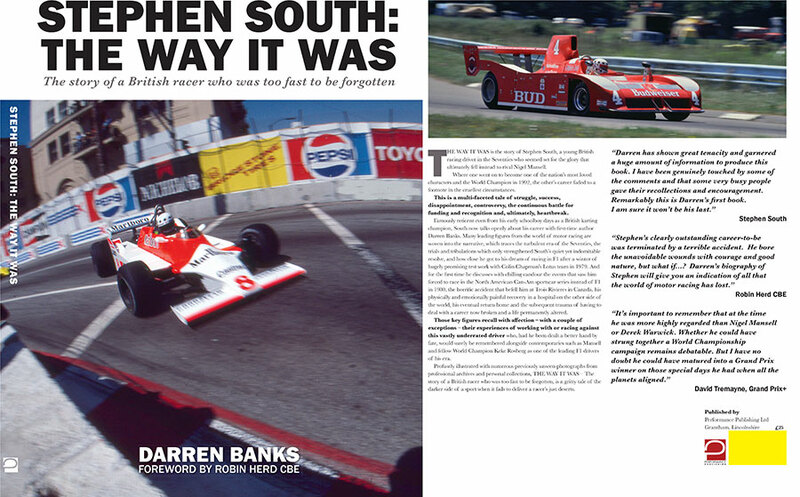 Famously reticent even from his early schoolboy days as a British karting champion, South now talks openly about his career with first-time author Darren Banks. Many leading figures from the world of motor racing are woven into the narrative, which traces the turbulent era of the Seventies, the trials and tribulations which only strengthened South’s quiet yet indomitable resolve, and how close he got to his dream of racing in F1 after a winter of hugely promising test work with Colin Chapman’s Lotus team in 1979. And for the first time he discusses with chilling candor the events that saw him forced to race in the North American Can-Am sportscar series instead of F1 in 1980, the horrific accident that befell him at Trois Rivieres in Canada, his physically and emotionally painful recovery in a hospital on the other side of the world, his eventual return home and the subsequent trauma of having to deal with a career now broken and a life permanently altered. Those key figures recall with affection – with a couple of exceptions – their experiences of working with or racing against this vastly underrated driver who, had he been dealt a better hand by fate, would surely be remembered alongside contemporaries such as Mansell and fellow World Champion Keke Rosberg as one of the leading F1 drivers of his era. Profusely illustrated with numerous previously unseen photographs from professional archives and personal collections, THE WAY IT WAS – The story of a British racer who was too fast to be forgotten, is a gritty tale of the darker side of a sport when it fails to deliver a racer’s just deserts. Performance Publishing is accepting preorders. You can also follow on Facebook.